But that can be a huge task for an already-burdened performance management or learning development team. 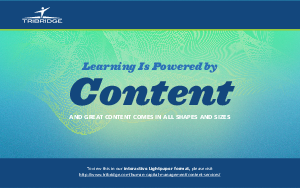 “Learning Is Powered by Content — And Great Content Comes in All Shapes and Sizes” explains why an effective response to that challenge is to outsource learning content strategy and execution to a provider that specializes in two critical areas: content services and solutions for enterprise learning and development programs. Specifically, you’ll see how the Tribridge HCM practice can help increase user adoption, deliver more-effective learning, and create learning initiatives that propel people toward meeting business goals.